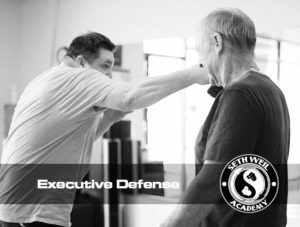 Seth Weil Academy Protects business owners and employees with our Executive Defense training courses, designed for scenarios within and around the workplace. The Executive Defense program is designed for businesses big or small. This program will teach your staff the same self defense techniques that are taught to Elite special forces, Navy Seals, FBI, CIA, Swat and over 18 government agencies. This program will teach you how to strike effectively, get out of holds and defend against weapons attacks as well as situational awareness training and how to defuse hostile situations, by using techniques such as finger jab (to eyes), groin kick, head-butts, knees and elbows. This is a simple, direct and effective approach to self defense.